This 5/8 inch I.D. 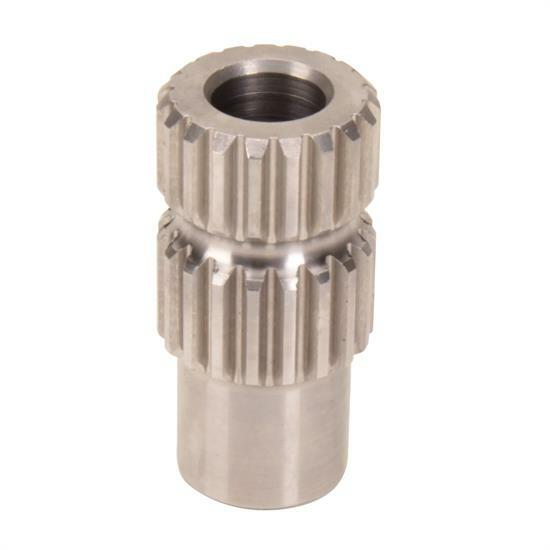 replacement weld-on splined sleeve is for use with 910-32852 quick release steering wheel hub. This item is sold individually. If you're going to buy a horn isn't it nice to know what it sounds like first? That's why Speedway produced a helpful video to hear the differences in the unique horns that we offer. Tim talks about OER steering wheels and the options we have to offer. Installing a horn button may seem daunting, but this 10 minute video will show you just how easy it really can be! Designing a steering system for your street rod can be tricky. In this article, we'll show you how to choose the right U-joints and steering shaft for the job. This article explains how to install a chrome column shifter into the steering column itself. We will help you determine the length of steering column needed along with all the parts required to get the job done. Speedway Motors employee Jeff K. has hand his hands on a lot of projects through the years. Check out his how-to on the repaint of the steering wheel on his '46 Ford Sedan Delivery.